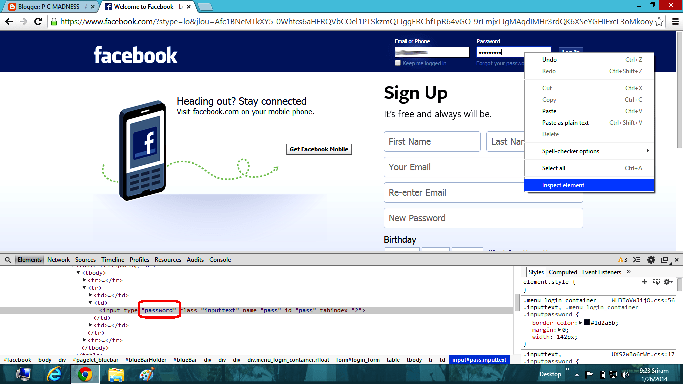 Stealing Password from the Developer Options(Inspect Element). 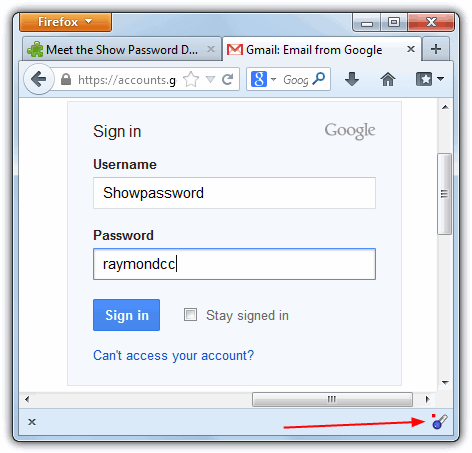 Many people are using ‘Google Chrome’ or ‘Mozilla Firefox as’ their web browser so, now we discussing about how others can steal passwords from Firefox and google chrome through developer options(Inspect Element). Then, Give Right click or shortcut key ‘ctrl+shift+I’ on password box and we find an inspect element (developer options) option in bottom, click on it then you find a developer tab in down and then search for the above rounded red code ‘<input type=”password”‘, change the ‘type=”password’ as ‘type=”text’, finally you will change the dotted password as text password as shown the figure. Give Right click on password box and we find an inspect element (developer options) option in bottom, click on it then you will see a developer tab in bottom or side of the web browser and then search for the code ‘<input type=”password”‘, change the ‘type=”password’ as ‘type=”text’, finally you will change the dotted password as text password as shown the figure below. 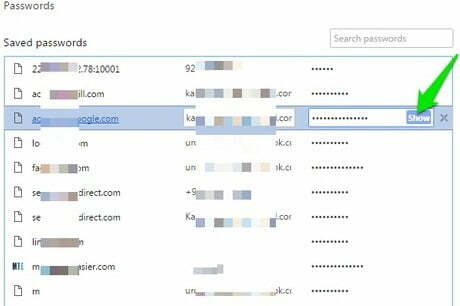 There are some third-party password showing extensions such as ‘ShowPassword’ , ‘LastPass’ ‘1Password’ and etc, these third-party extensions will show password by hovering the mouse pointer on saved password or password box,This is an easy process to revel others passwords through these extensions, you can adjust these third-party extensions settings. This is very dangerous than all the above processes, this pen drive consists of some .exe files and some pre-prepared ‘autorun.inf’ and ‘launch.bat’files, if you connect your PC with this pen drive, the pre-prepared ‘autorun.inf’ file automatically run in background and steal all saved passwords from your web browser, and saves all steeled passwords in pen drive in the form of text files. 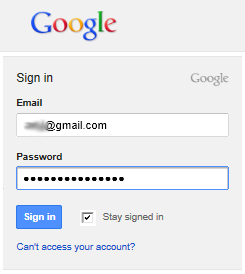 Others can easily steal your password through this process, to revel the passwords through this process you must have to go to ‘customize and control chrome >settings>manage passwords’, finally you will find a page as given below and click on show button to revel passwords. So, don’t save your personal passwords in web browser, if you save passwords in your browser others can easily revel your passwords through above ways and use your account passwords for wrong purposes, if you save personal passwords in your browser do not give your pc to others by this precautions you can secure your passwords from others.